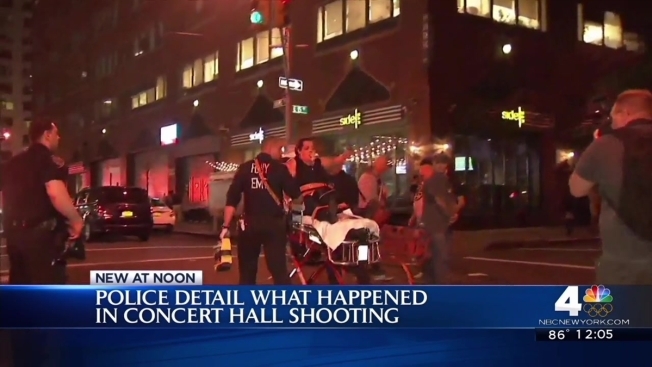 A man died and three others, including rapper Troy Avenue and one bystander, were wounded in a shooting at a New York City concert venue where the rapper T.I. was scheduled to perform Wednesday night, police said. The person who was fatally shot was identified by police as Ronald McPhatter, NYPD Chief of Detectives Robert Boyce said at a press conference Thursday. His relationship to rapper Ronald Collins, known as Troy Avenue, was not immediately clear. A 26-year-old woman was also shot in the leg. She was taken to Bellevue Hospital and is expected to survive. The fourth victim was a bystander, struck by a bullet that pierced through the floor of the green room and hit him as he stood near the bar on the floor below. He was recovering at an area hospital and is expected to survive, police said. The shots rang out in a third-floor green room as about 950 people shuffled into the concert shortly after 10 p.m., police said. The melee began as a fist fight, but quickly devolved into a shooting, Boyce said. Police said Thursday that they have not made an arrest, but have strong leads in the case and video of the shooting. They've also recovered 5 shell casings at the scene, police said. Rapper T.I. does not appear to have played any part in the shooting, officials said. NYPD Commissioner Bill Bratton called rappers "basically thugs" Thursday morning during a radio appearance. "The crazy world of these so-called rap artists who are basically thugs that basically celebrate violence they did all their lives," He said. "Unfortunately, that violence often times manifests itself during their performances." The streets around Irving Plaza music hall were still closed Thursday morning as police continued their search for the gunman who opened fire at the venue. Liv Hoffman, 19, was in the balcony VIP area to the left of the stage when the shooting happened. She said there had been some kind of argument between two groups of people before the shooting. A girl she had been talking to was one of the victims. "The girl next to me was shot point blank, and men picked her up and carried her out," Hoffman told The Associated Press, still shaken by the events that unfolded right in front of her. "For two to three minutes we still heard firing, still heard shots, we were clutching each other making sure no one was getting hit." Video shot inside the 1,025-person venue showed a chaotic scene as concertgoers rushed to the sides trying to leave the area as a group of people tended to a person on the floor. Elijah Rodriguez was attending the concert with his sister and they were in the VIP area by the stage. He said T.I. was supposed to go on stage at 9 or 9:30 p.m. but "he never showed up." At or around 10 p.m., Rodriguez said the venue started playing music again, and at about 10:15 p.m., he saw a line of people coming out from where the performers were coming onstage. "All the sudden I heard someone saying that there was a shot, that someone got shot," Rodriguez said. Sources say 30-year-old, Brooklyn-based rapper Troy Ave was shot in the leg during the shooting. Rodriguez didn't actually hear the shots himself, but heard people saying that someone had gotten shot. "It was scary to deal with. When I got outside, like literally across the street, there were a few girls having, like, panic attacks. One girl thought she saw someone get shot in front of her," Rodriguez said. A concertgoer who did not want to give his name said he was near the stage when there was a sudden stampede. "Everybody was having a good time until everybody started running — that's it," he said, adding that some panicked people fell on their way out. Police said metal detectors were set up at the concert venue, but the concertgoer said security getting into the concert was lax. "They didn't search nobody, they didn't check no IDs," the unnamed man said. Police say they're investigating how the shooter got into the venue with the metal detectors set up. Representatives for T.I., whose real name is Clifford Joseph Harris Jr., said they were referring all questions about the shooting to police.